38109 134th St.- Canton, MN. Mabel is located east of our cabin approximately 11 miles. Mabel is a small town community but do offer 2 large celebrations each year. They are know for the 50's & 60's Weekend which is the 2nd Saturday in August which for 2016 it will be Saturday, August 13th. Check out all the neat classic cars they have on display for that Saturday. Hesper-Mabel Steam Engine Days in one of the towns largest celebrations which this year will be celebrating 65 years. 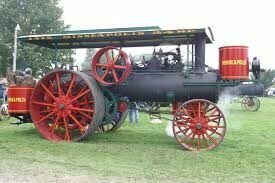 They have a parade of Steam Engines and Classic Tractors both Saturday and Sunday parades which start at noon both days. To follow them they a wonderful parade and activities down on the Steam Engine Grounds to follow. Check them out they year, Steam Engine Days is the weekend following Labor Day every year.